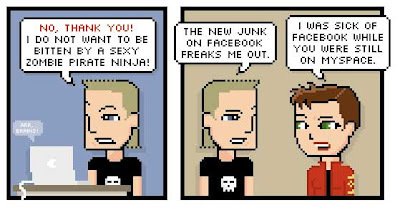 Random Anny .Com: Facebook finds Purpose! I'm against social networking websites. I've been managing websites for over a decade, have co-built on-line communities and wasted more hours in on-line gaming than I want to consider. Hell I post on this blog daily! Yet when it comes to sites like MySpace and FaceBook I'm not interested. Part of it is knowing my own limitations. I have an addictive personality and know I'd just end up cyberstalking my grade school neighbor's third cousin removed to Siberia instead of being productive. Hell, even imaginary blogger Zach Randle has been suckered into FB drama all this week. My life is drama free and I prefer it this way. I'm also intensely private. The idea that anyone with idle time and my full name can stalk me for current pictures, hobbies, locations, interests and friends gives me the wiggins. No sir, I prefer to maintain my communications the old fashioned way - through texting! "WELLINGTON (Reuters) - New Zealand police have arrested a safe burglar by using the popular social networking website Facebook to identify and track him down. That is a brilliant idea! Websites love dropping cookies and performing targeted marketing - police should be able to display wanted, runaway and kidnapped mugs on websites too. Find a useful application for these time sinks already! that comic is aweseome :) it's actually pretty sad that as SOON as i got my Myspace all up and ready to go, Facebook took over and i had to create another since all my friends switched over! i don't care though, gotta love those internets!